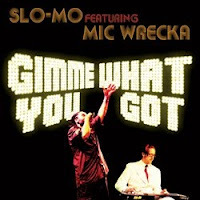 At the core of Slo-Mo is the somewhat unlikely partnership of Mike ‘Slo-Mo’ Brenner, a virtuoso steel guitar player, and a rapper named Mic Wrecka. Together with their band, including vocalist Susan Rosetti, they make some of the more interesting sounds you’re likely to hear these days. For such a talented musician, Brenner has had a tendency to keep his playing understated in the past, allowing the band to create a nice funky, somewhat mellow groove as a back drop for Mic Wrecka’s imaginative, uplifting messages. This time out, Brenner makes it known from the opening track, [Click to listen] “Skanky”, that he’s a force to be reckoned with as he unleashes the most torrid playing he’s ever recorded. “County” is another song in this musical vein as Brenner lays down a wicked riff over the martial drumbeat of Mark Schreiber, and Wrecka describes the drama of lockup. Brenner opens [Click to listen] “Baby, Say Goodbye” with a gentle country pattern played on dobro before handing the stage to Rosetti whose voice reminds me of the purple majesty of Prince in the ’80s. Then Wrecka enters with a plea to his loved one to end a faltering relationship before it gets any uglier. It’s a heartbreaker that’s presented in a more grown up fashion than we’re used to hearing in breakup songs from the latest teen sensation. Do me a favor, get this album, and while you’re at it, get the older ones too. Maybe then we can all get to see Slo-Mo live in our own cities. Gimme What You Got is available from the Authentic Records Online Store. Slo-Mo’s album release party is Saturday, September 12 at Johnny Brenda’s in Philadelphia with special guests the Fractals, and Adam and Dave’s Bloodline.